Suzanne Goin’s cookbook “Sunday Suppers at Lucques” is a collection of seasonal meals from her award-winning restaurant in Los Angeles. It is not uncommon that cookbooks by chefs of her caliber become coffee table books, that are rarely put to use, because either the recipes are too involved or the ingredients are too hard to find. That’s not the case for Sunday Suppers. Many of its recipes are uncomplicated, but their small details make them special. 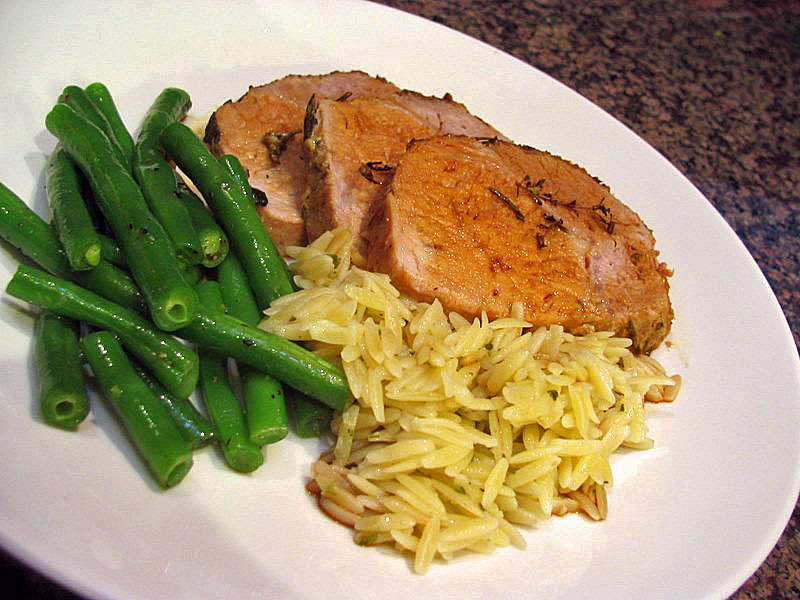 In this recipe for pork roast the double application of a simple mustard and herb marinade develops a delicious flavor. It’s hard to improve a classic, but this method does it. 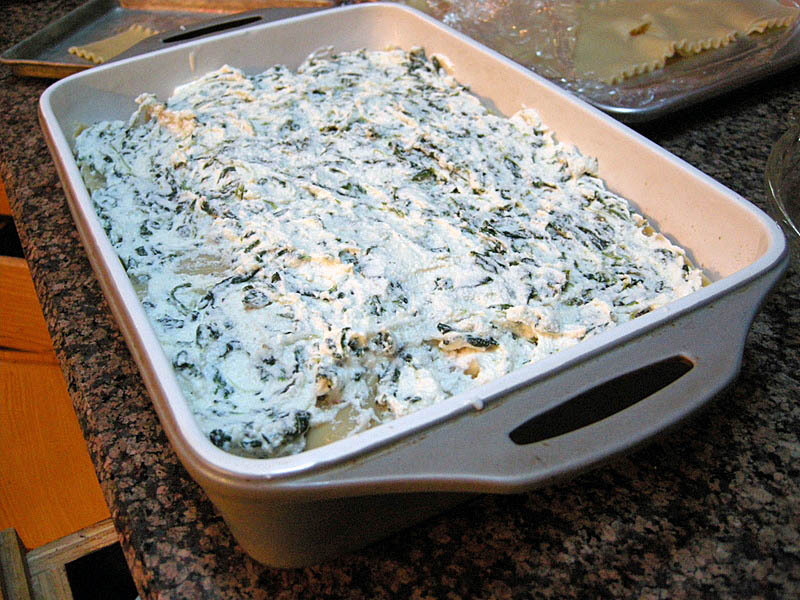 Whisk the mustard, thyme leaves, parsley, and 1 tablespoon of olive oil in a shallow baking dish. Stir the garlic, and brush the mixture all over the pork loin. Cover and refrigerate overnight (or at least 4 hours). Remove the pork from the fridge one hour before cooking, after 30 minutes season it well with salt and pepper. Reserve the marinade. Heat the oven to 325 F. Heat 2 tablespoons of olive oil in a large skillet until it is almost smoking. Place the pork loin in the pan, sear it on all sides, until well browned (do not move the pork around too soon, you need to allow the browning to take place). The whole process should take 15 to 20 minutes. Transfer the pork to a roasting rack, and brush the reserved marinade all around it. Reserve the pan to make a sauce. 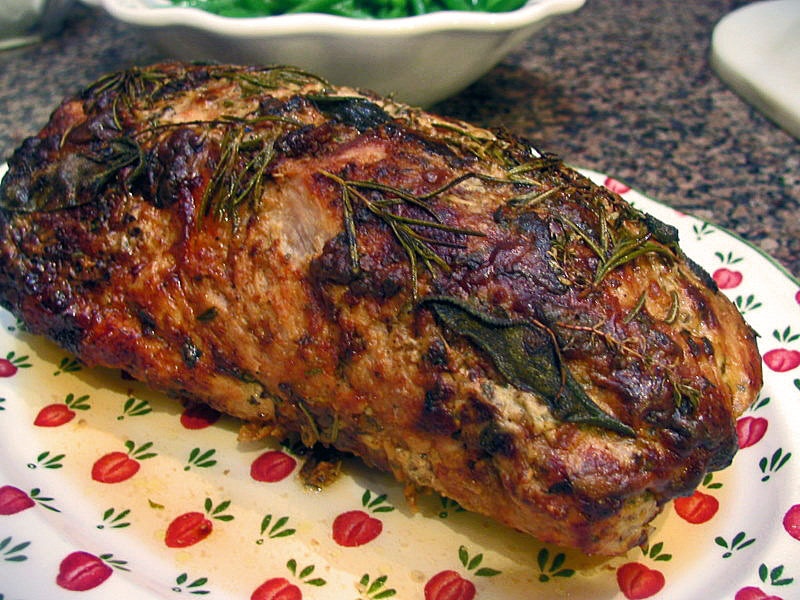 Arrange the rosemary, sage, and thyme sprigs on the roast and top with 3 tablespoons of butter. 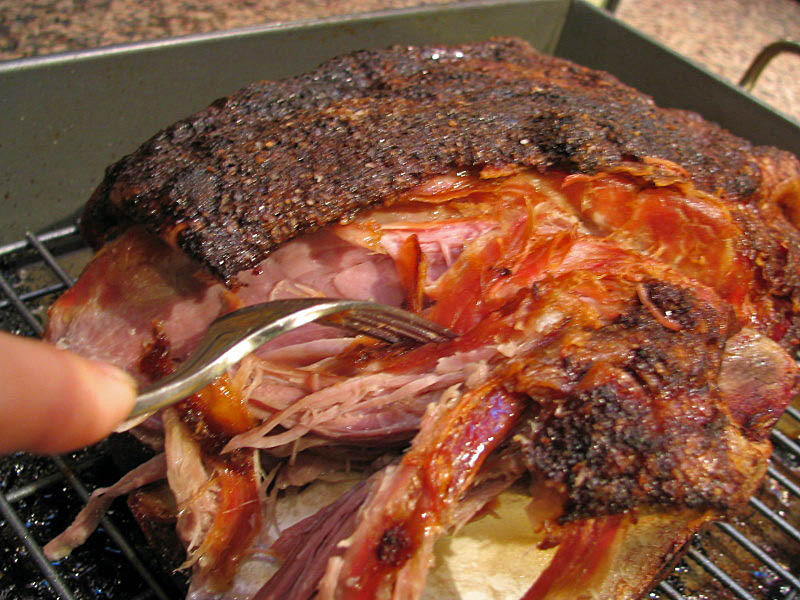 Roast the meat until a thermometer reads 120F – about 1 hour and 15 minutes. Let the pork rest at least 10 minutes before slicing. While the pork is roasting make a sauce: heat the pan you used to sear the meat on medium, add 1/2 cup water (or chicken stock if you prefer)and stir until it boils, also scraping the bottom of the pan. 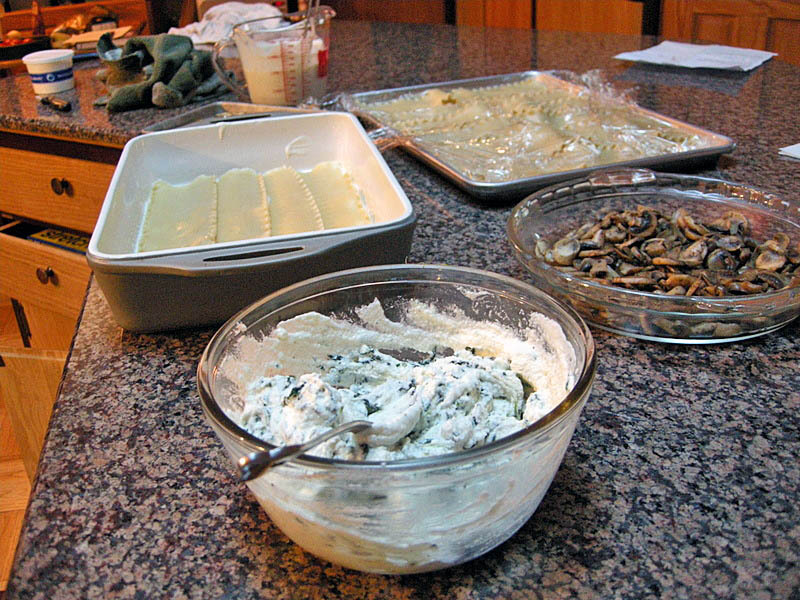 Reduce by boiling a few minutes, swirl 3 tablespoons of butter and reserve until time to serve. Heat the oven to 375F. Place the breadcrumbs in a bowl. Melt the butter in a small saucepan, whisk in the mustard, thyme, and parsley. Remove from the heat, let it cool slightly, and add to the breadcrumbs, tossing to coat. Transfer to a baking dish and bake for 10 to 12 minutes, until golden brown. To serve, slice the meat, spoon the sauce over, and shower it with mustard breadcrumbs. Heat the honey, soy sauce, garlic, and ginger in a small saucepan, until the honey melts and the sauce is smooth. Let it cool, and pour over the chicken arranged on a baking dish, skin side down. Cover the dish with aluminum foil and marinate overnight in the fridge. Heat the oven to 350F. 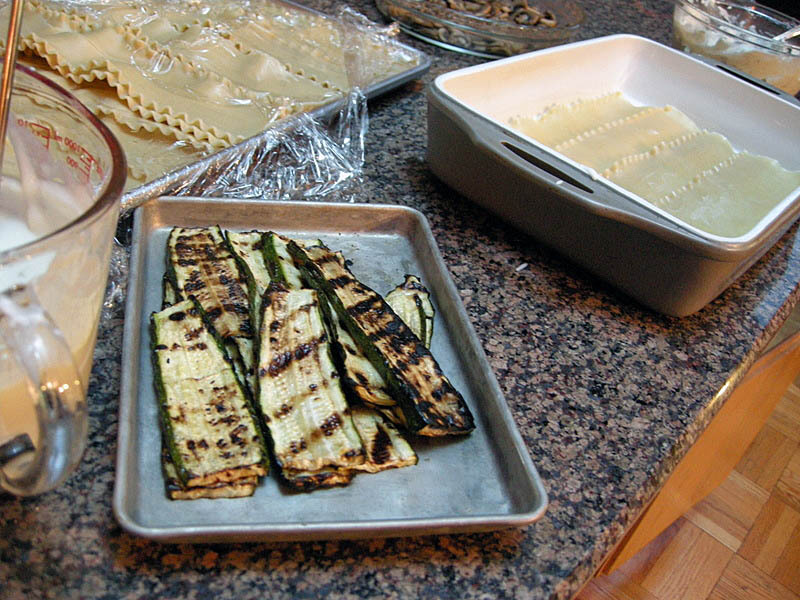 Place the dish in the oven, still covered, and cook for 45 minutes. Remove the foil, turn the chicken skin side up, add the pieces of parsnips around the chicken, making sure to coat them with some of the sauce forming at the bottom of the dish. Increase the oven temperature to 375F and continue baking for at least 30 minutes, until parsnips are tender, and the chicken is fully cooked. The sauce should be very dark brown. 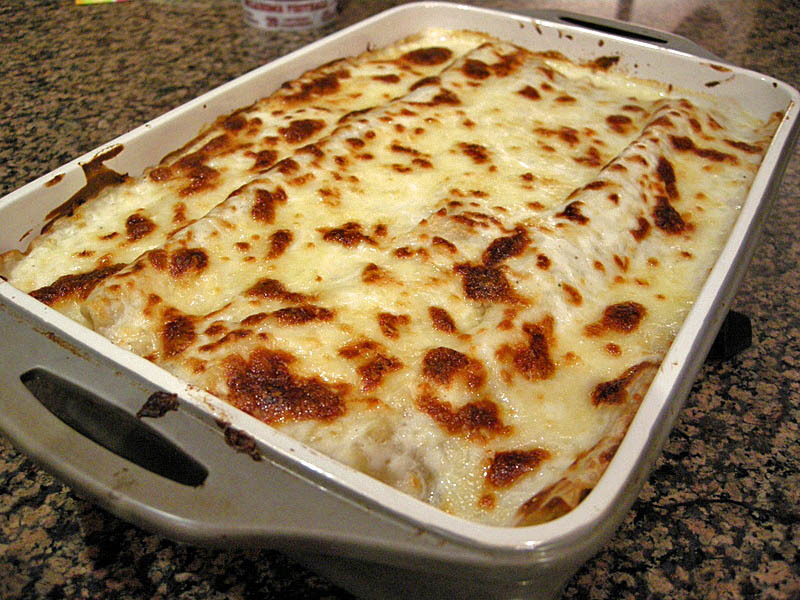 Comments: I modified the recipe to increase the cooking time, add some parsnips and reduce the garlic. I’m in the minority, I know, but I dislike the over-use of garlic. 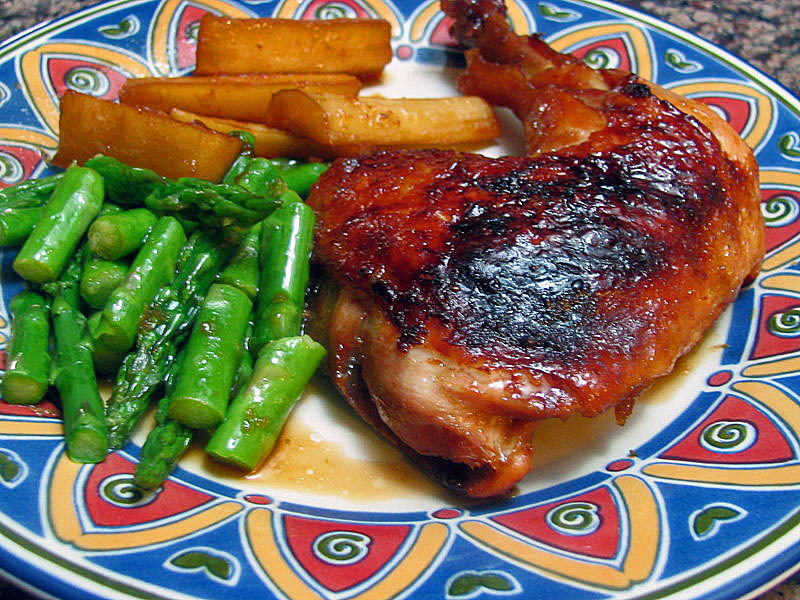 And here’s another shocker, the parsnips were as good as the chicken itself. We couldn’t stop eating them! Lastly, the side portions of lemony asparagus brightened the whole meal, to round out a delicious Sunday dinner. 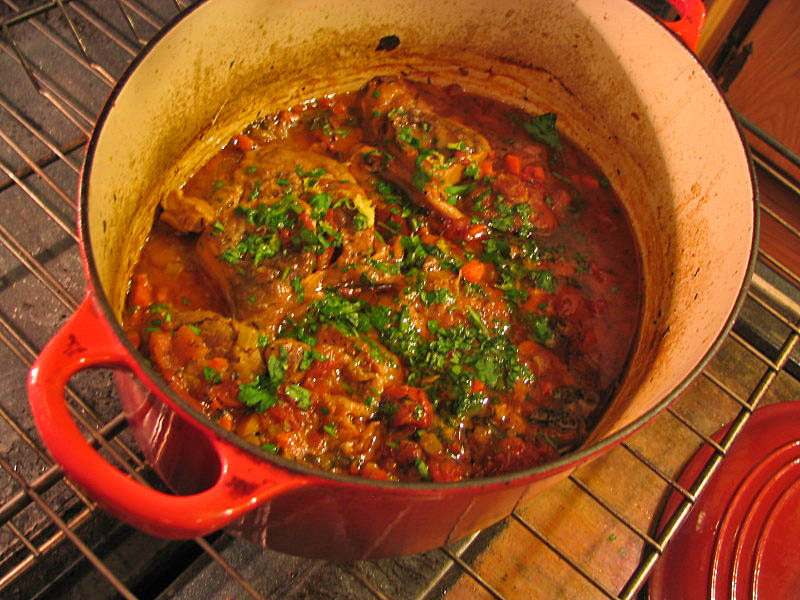 Ossobuco milanese is perfect for cold evenings, and great for company, as you can prepare it in advance and re-heat it when your guests arrive. Like most braises, it gets better with a day or two of rest in the fridge. Traditionally, it’s served with a saffron risotto, but this time I made it with mashed potatoes. The sauce is so luscious, and mashed potatoes are also a perfect match. 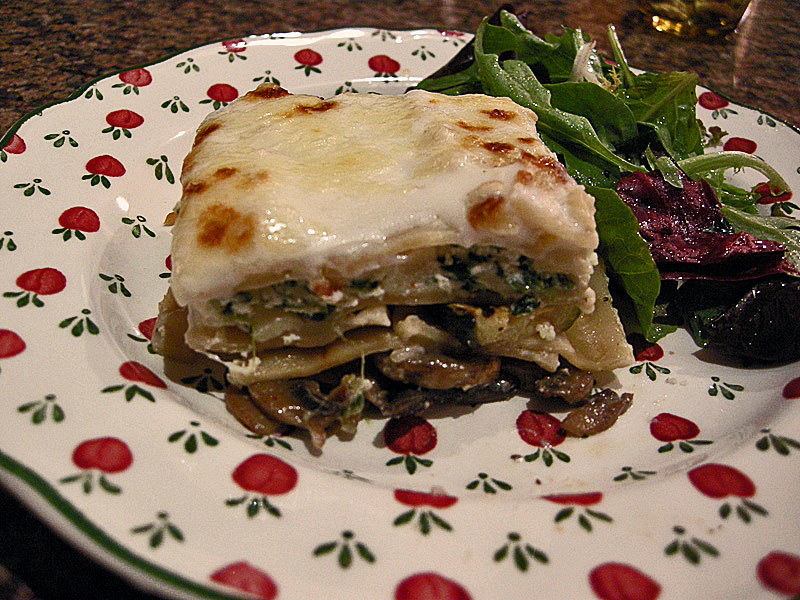 When preparing such a classic dish, I avoid “simplified,” “easy,” “quick,” “low fat,” or “light” versions. 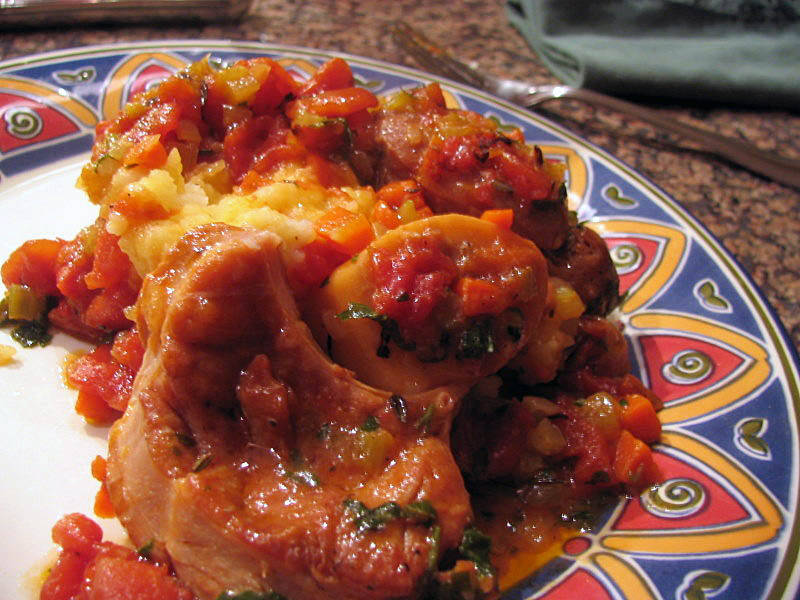 My favorite recipe for ossobuco comes from Marcella Hazan, a respected authority on Italian cooking. 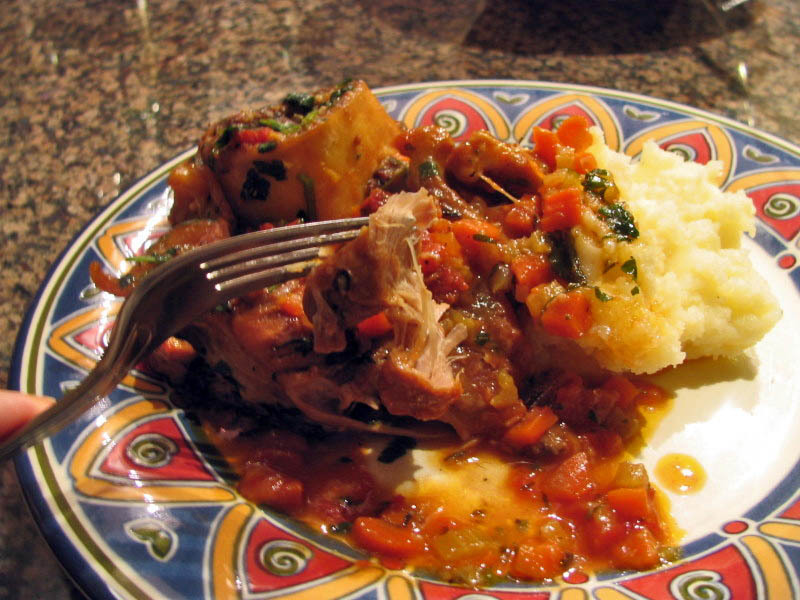 I scaled down her recipe, which is posted below, and cooked only 4 veal shanks. 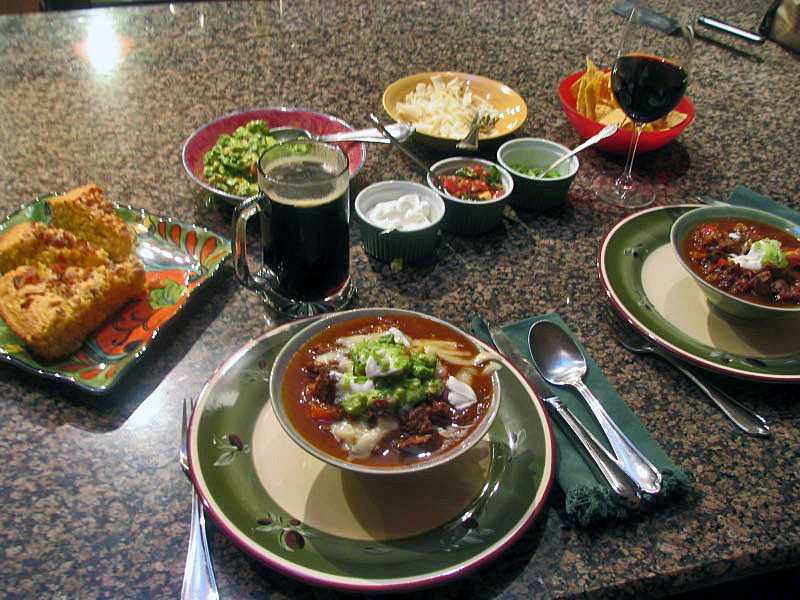 But, the dish is satisfying, and the original recipe is certainly enough for 6 to 8 happy folks. 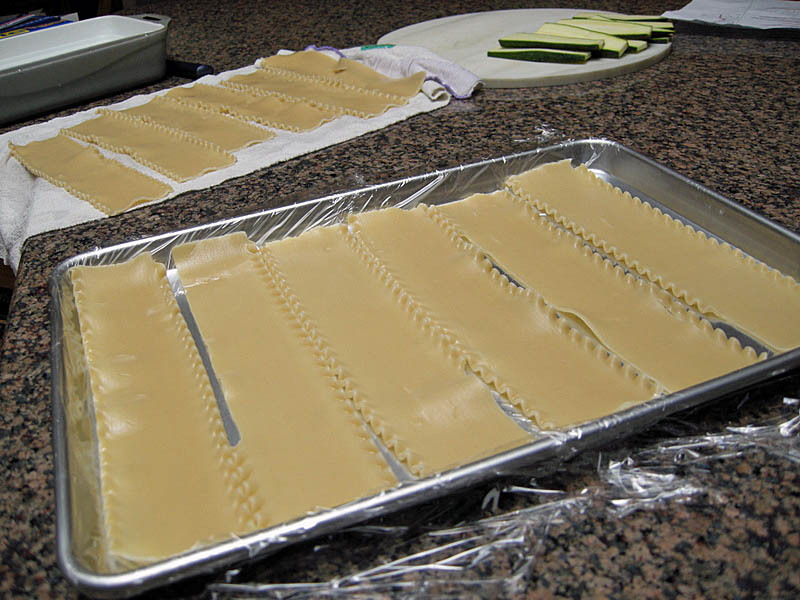 Tie each shank tightly with a piece of twine to prevent them from falling apart during cooking. Lightly season the shanks with salt and pepper, then flour both sides of the meat and brown them in a skillet with very hot olive oil. Set the meat aside, discard most of the oil, deglaze the pan with 1 cup of white wine, and set it aside. 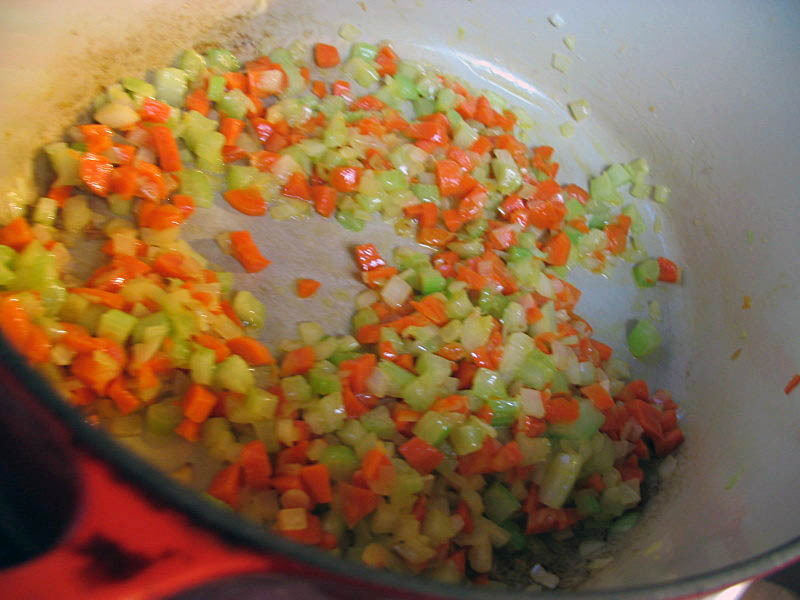 Add butter to an oven-proof pan with a tight-fitting lid (like a Le Creuset pan) large enough to hold the meat in a single layer, and saute the onion, carrot, and celery mixture for about 6 minutes, until translucent. 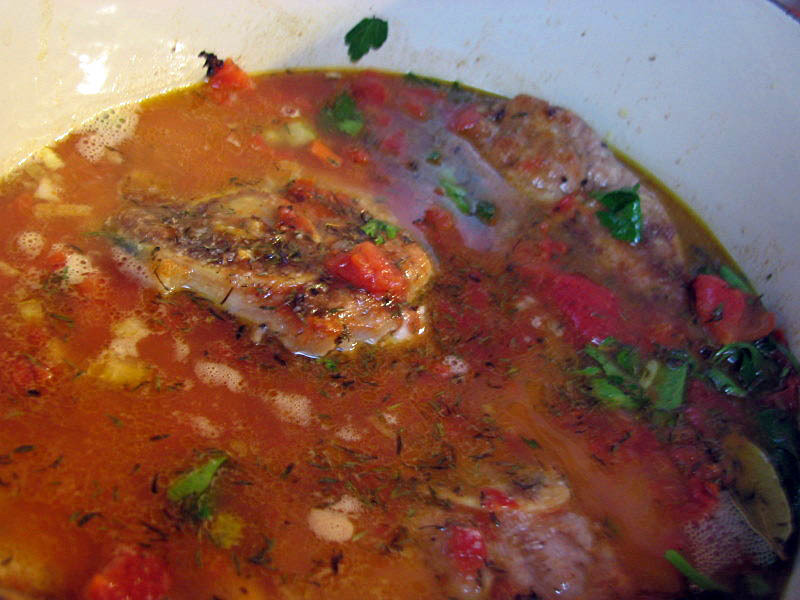 Add the lemon peel and cook for a couple more minutes, then add the meat to the sauteed veggies, pour the wine from deglazing the skillet over it and add the stock, the tomatoes, bay leaves, and thyme. Season with salt and pepper. Bring the contents to a simmer, cover and transfer the pan to the oven. 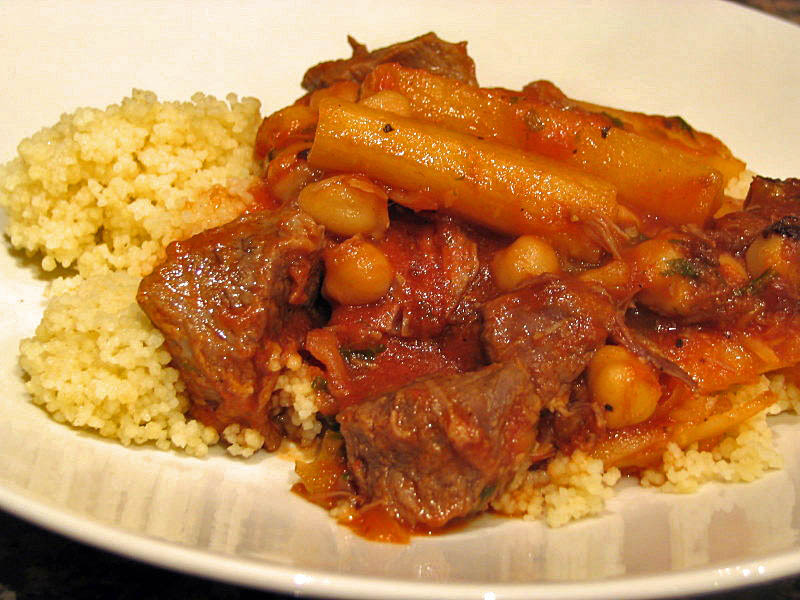 Let it cook for 2 – 3 hours (depending on the thickness of your shanks), until the meat is fork tender. If the pot gets too dry, add a few tablespoons of water. Add the gremolata on top of the meat and sauce a few minutes before serving, and don’t allow it to cook for a long time. Cut the twine around the meat, and serve. 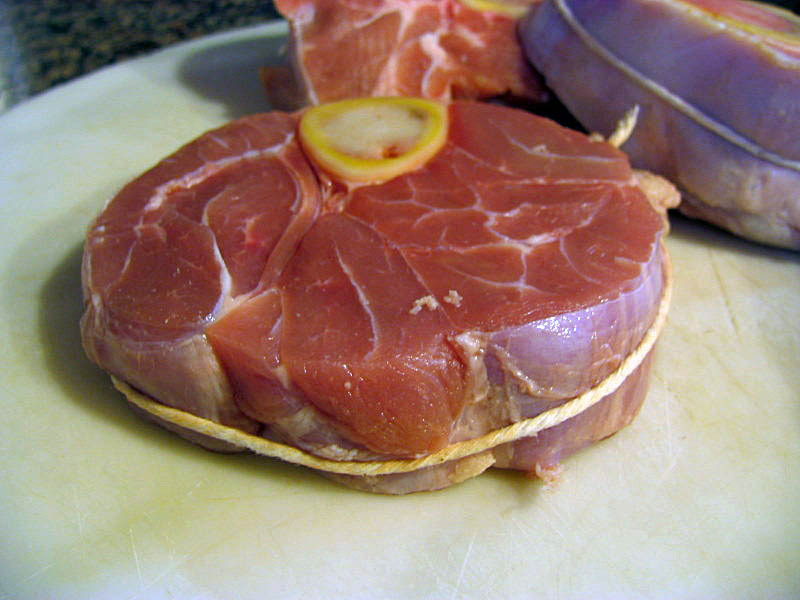 Comments: The ideal thickness for veal shanks in ossobuco is 1.5 inch. Mine were slightly thinner, which made it difficult to tie the string around them, but the meat cooked faster: a little over 2 hours was enough. I expected that the string wasn’t going to stay tied during the cooking, but I decided to use it anyway. Another important tip from Marcella: don’t remove the silver membranes around the shanks, they help preserve the shape of the meat as it braises. 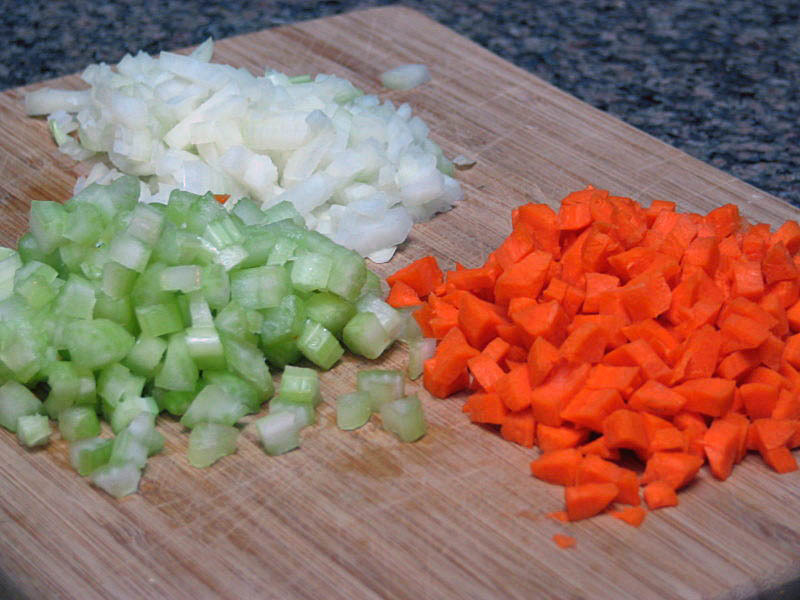 Cutting the veggies: for this recipe, I diced them by hand, as uniformly as possible. 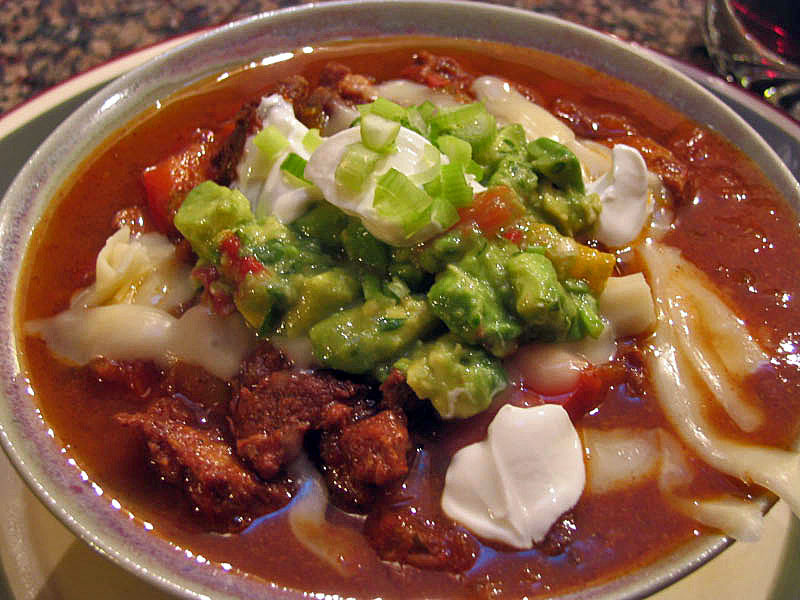 Since they are so prominent in the sauce, using a food processor or other gadget compromises the presentation. Marcella advises to add liquid up to 3/4 of the height of the shanks; I added a little more, but I didn’t have to adjust the amount until the end. Every half an hour or so I flipped the shanks in the liquid, and made sure that it wasn’t boiling too furiously. During the final 45 minutes I lowered the temperature to 325F. We had it with a nice slice of homemade sourdough bread, anointed with some of the bone marrow – it was pure bliss! I can hardly wait to enjoy the leftovers later this week!